IN the final stanza of the National Under 18 Championships, all roads lead to Etihad Stadium where the Allies take on Western Australia, and Vic Metro hosts South Australia in an enticing double header. Vic Metro and South Australia become the headline act with the winner-takes-all mentality given the title is on the line for both sides. The opening game of the final round pits the Allies against Western Australia. The winner takes third spot on the final table of the National Under 18 Championships, with both teams having sole wins over Vic Country, and losses against South Australia and Vic Metro. The Allies come into the game with a strong squad, omitting bottom-ager Thomas Green who had been solid so far, and rotating Dirk Koenen for Matthew McGuiness. Overager Michael Mummery gets his chance to shine on Etihad, while the Western Australian side has three fresh faces to add to it’s victorious team over Vic Country. Ian Hill is a huge loss for the Black Swans, with the West Australian captain banned for a sling tackle on Laitham Vandermeer last Friday. With injuries to Damon Greaves and Thomas Baldwin, Western Australia flew over Wil Hickmott to join the squad, and he will run out tomorrow with Luke Moore and Ethan Hansen as the other changes. The midfield battle will be intriguing with Hickmott joining Sydney Stack, Luke Foley, Deven Robertson and Luke English in the middle. Jack Buller will have his work cut out for him against man mountain Kieren Briggs who is in super form for the Allies. He has been giving his midfield of Tarryn Thomas, Connor McFadyen, Chayce Jones and Fraser Turner first chance at the stoppages. Jacob Koschitzke is in fine form and could be the man for Dillon O’Reilly who has been showing promising signs as a key forward, while Jason Carter and Jordan Clark provide plenty of dash off half-back. Bailey Scott and Connor Budarick will look to keep them honest, while Nick Blakey looms as the danger man for the Allies and one that Western Australia – and perhaps Regan Spooner in particular – will look to contain. Overall, the Allies will head in as favourites, but the West Australians move the ball quick and cleanly to the forward line and it is hoped Jarrod Cameron can provide the spark again after he booted five goals in Geelong. In the game that everyone will tune in for, the National Under 18 Championships title will be on the line for the undefeated Vic Metro and South Australian sides. In what ended up being a perfect fixture for the AFL, the two best sides are going head-to-head in the final match of the series with the winner to be handed the trophy and celebrate afterwards without any interruptions to other fixturing. South Australia has made its expected two changes, with Mihail Lochowiak and Jacob Collins replacing Kai Pudney and Boyd Woodcock in the team. Vic Metro has rotated rucks for the final game, with Tom Hallebone recalled to ruck against James Siviour after injury struck down Joe Griffiths. Jack Bytel has been named in the side despite suffering what looked to be an injury in the last round which would keep him out of the final match. Isaac Quaynor and Ben Silvagni return from injury and will strengthen both ends for Metro. The match-up on everyone’s lips – Jack Lukosius pitted against Ben King – is unlikely to happen despite recruiters hopes, with both players named forward. As we saw in Geelong, Lukosius also played on the wing and down back, standing side-by-side with Tarryn Thomas and Nick Blakey at different times showing his versatility. If things start to head south for Vic Metro, King can also play in defence, while Will Kelly is a capable forward if required. It is predicted Kelly will get first chance on Lukosius, while James Blanck will line-up on Hugo Munn. The midfield battle of Izak Rankine, Luke Valente, Tom Lewis and Jackson Hately up against Bailey Smith, Riley Collier-Dawkins, James Rowbottom and Zak Butters is mouthwatering and likely to decide the contest. With both teams having plenty of firepower up front, the midfield is where the game will be won or lost. Curtis Taylor showed he is a danger up forward for Metro, while Xavier O’Halloran and Noah Anderson have already shown through the championships they can boot multiple goals. Will Gould and Riley Grundy are in great form – the latter is the man predicted to head to King. Jez McLennan and Martin Frederick provide great run out of defence and will be keen to break the lines, while Quaynor and Tom McKenzie will be keen to do the same up the other end. It is hard to pick a winner in this game, with both sides filled to the brim with quality. AFTER four rounds of National Championships, the 2018 title comes down to final game with Vic Metro taking on South Australia in a battle of the two undefeated sides. Earlier tomorrow, the Allies will face Western Australia for third spot on the table. The interstate sides have made two changes each, with Western Australia forced to make three and in the process, flew Wil Hickmott to Victoria for the game. Vic Metro has named an extended bench for it’s clash with the Croweaters. The Allies and Western Australia head into this match with a win over Vic Country each, and looking to cement third spot for the carnival. Overall, the Allies have been in better form, going down to Vic Metro by just two points, and leading South Australia at half-time before being overrun in the second half. Western Australia was smashed by South Australia and had a competitive effort against Vic Metro, but will go into the clash as underdogs, especially considering star player Ian Hill is out through suspension. Joining him as the outs are Damon Greaves and Thomas Baldwin – both of whom are injured. The two carry-over players in the 25-man squad, Luke Moore and Ethan Hansen come into the side, as well as Wil Hickmott who performed strongly in the WAFL on the weekend and has been flown in as Hill’s replacement. For the Allies, Thomas Green and Dirk Koenen have been named as the two emergencies with Mathew McGuiness replacing Koenen in a key defensive post, while overager Michael Mummery comes into the forward line. In the game everyone has been waiting a month for, Vic Metro hosts South Australia in the title decider. Both sides head into the clash relatively fresh, with Isaac Quaynor and Ben Silvagni both returning from injury, while Joe Griffiths is the only forced change. Xavier Fry and Alastair Richards both played on the weekend as a sign they were omissions from the Metro side, while bottom-ager Ryan Gardner is also out of the team. Despite sustaining an injury in the last match at the MCG, Jack Bytel has been named on an extended bench, with bottom-agers Noah Anderson, Jack Mahony and Matt Rowell all named in the team with two to be cut. For South Australia, Jacob Collins and Mihail Lochowiak come in for their taste of action after sitting out the game last Friday, with Boyd Woodcock and Kai Pudney making way and named as emergencies. AFTER releasing our team notes on the Allies and South Australian match last night, we had a number of writers take a look at the Vic Country and Western Australia match. Scott Dougan, James Goller and Callum Thomson watched the Vic Country side closely, while Peter Williams and Lenny Fogliani took notes on the West Australian team. Hamill spent the majority of the game in the back half but was given the opportunity to play through the middle in the last quarter. He laid some strong tackles and used his accurate left foot to hit up his teammates. Hamill’s best passage of play came in the second quarter when he went back with the flight and took an eye-catching contested intercept mark. Walsh was at his usual best, gathering plenty of disposals in all areas of the ground. He won a fair share of the ball on the outside of the contest but he demonstrated yet again that he can play inside when necessary. Walsh is a very consistent footballer who rarely plays a poor quarter of footy. His awareness, composure and decision making was a real highlight for Vic Country, especially when they needed someone to step up. The reason Walsh is able to accumulate so much of the ball is because of his extreme work rate. He is an elite runner and works tirelessly to make as many contests as possible. He was involved in many passages of play in the second quarter that all resulted in goals. Walsh also kicked an impressive snap from the boundary line that kept Vic Country within striking distance. Was one of Vic Country’s best. The Dandenong Stingray was given the opportunity to impress throughout Country’s midfield and that is exactly what he did. Bedford showed that he can win the ball on the inside and outside. He was aggressive around the contest and constantly put his head over the ball to win possession. His speed and agility were also evident and undoubtedly helped him escape congestion on numerous occasions. He was exceptionally clean at ground level and displayed composure with ball in hand. One of my favourite passages of play came in the last quarter when he turned the ball over by foot, but redeemed himself by sprinting 50 metres forward to win possession back. Impressive game. Duursma was a little quieter compared to his past two performances. He found a bit of the ball but was unable to have a huge influence on the game. His match-time was shared between the midfield and backline, signifying just how versatile he can be. His competitiveness, ball use and ability to release his hands to handball was still on display throughout the match. The over-ager from the Murray Bushrangers started the match well before he was involved in a crunching tackle by Ian Hill, only five minutes into the first quarter. He was concussed and had his collarbone broken in the contest. He played no further part. The number one pressure player in the National Championships was again fierce around the contest. His defensive pressure and tackling was brilliant but probably did not have as much impact on the game as he would like. He collected the majority of his disposals in the third quarter where he was involved in several passages of play. What impressed me the most with McHenry was his effort and high intensity when he didn’t have the ball. He is always trying to apply pressure and he never drops his head if things don’t go his way. Foot played on the wing but also played inside at times. He was very clean at ground level and provided some much needed outside run. His work rate and elite endurance became clear in the third quarter when he sprinted hard defensively to spoil a marking contest. The Bendigo Pioneer was part of the midfield rotation for Country but played the majority of the match in back half. Keighran seemed to work hard but was unable to have much impact on the game, finishing with eight disposals and two clearances. Berry demonstrated his versatility yet again, playing predominately in the back half, but also provided some outside run when required. His competitiveness, attack on the ball and defensive spoiling was top notch but he was constantly let down by his ball use. He rebounded well when exiting the defensive 50 but missed targets multiple times. He had three turnovers in the space of two minutes, with one resulting in a goal for Western Australia. Berry moved forward in the last quarter to try and give Country some much-needed spark but could not have the same effect as he did down back. One to definitely look out for in the 2019 draft. Was really impressive. Playing mostly forward he had stints in the midfield . The Gippsland product, was very dangerous up forward kicking 1.1. He has kicked a goal in every one of his games this carnival, showing a consistent impact on the scoreboard. A real highlight for Flanders is the pressure he puts on his opponents. He laid five tackles, but it was not just his tackles that was impressive he was able to put on all sorts and types of pressure on his opponents. Stephens had 14 disposals against Western Australia. He showed that he has good hands within congestion. He dropped a simple chest mark which was not great. However he showed some speed and was able to have three inside 50s and thre rebounds. He also took a nice mark and spoiled strongly in a few marking contests. The Murray Bushranger is one to definitely keep a eye on. 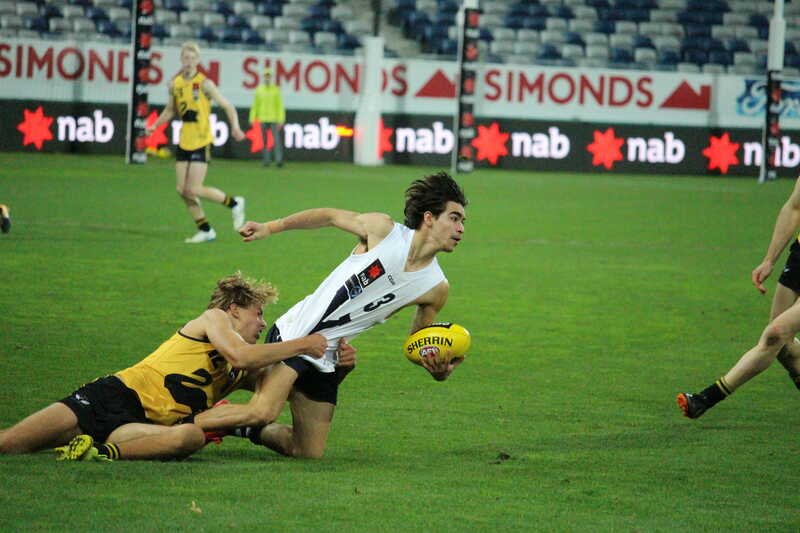 With fantastic TAC Cup form, Smith was selected to play his first game of the carnival and he did not disappoint. Smith had 30 possessions with 23 of them handballs. He really impressed on the inside with his contested work having nine clearances to his name. He also spread from stoppages well, with having three inside 50s and three rebounds. Definitely a draft prospect to pencil down. Really interested to see how his second half of the season goes after being Country’s best in the match. The Vic Country ruckman, had a solid game, collecting seven possessions. He had 32 hitouts, beating his opposing ruckman Jack Buller. A highlight of his game was his fierce tackling – finishing the match with five to his name. He showed some good ground work and had five kicks and two handballs, which was interesting because generally ruckman handball more then kick. Lloyd had 18 disposals for the game and was fairly good by foot. The defender looked strong in the contest and was very good one on one. Through the game he seemed to read the play well and made some good decisions with ball in hand. He not only was good defensively but he was able to counter attack a number of times. With five marks and three rebounds to his name, he was solid for Vic Country. Barzen did not have a lot of the ball recording only eight possessions however, he had impact. Barzen was on the receiving end of a handball in the goal square, but also earned it after hard running. He took a fantastic contested mark, arguably mark of the carnival to date. He showed good hand skills when in congestion and made the right decisions. Williams played in the forward line for the majority of the game. He took a number of strong marks and was able to find opportunities in front of goal. He showed great athleticism to put pressure on opponents and to create space when in possession of the ball. Williams finished with two goals and was Vic Country’s most dangerous threat up forward. Brownless started on the wing in the first quarter and rotated between there and half forward for the rest of the game. He took a mark inside 50 in the second quarter off the back of some good running on a fast break and was composed lining up for goal, kicking his only goal for the game. Brownless displayed clean hands and when up forward provided good pressure. The Geelong father-son prospect finished with 17 disposals and was one of Vic Country’s best. Smith played in the backline and at times had to match up on Cameron where he gave away a couple of free kicks. The Gippsland Power member did not get a lot of the pill but he was polished when in possession and always hard at the contest, making his presence known. Kemp played mostly off the half-back line where he was able to intercept and find a bit of the ball. When in possession he was confident and looked composed. He was efficient with his disposal and displayed good footy smarts. Playing his first game of the championships, Kemp did not look out of place and was one of Country’s better players. Carlin who had a quiet outing, was able to make the most of his limited disposals. He displayed clean hands and was able to link up with his teammates to get out of trouble multiple times. He found himself playing on Cameron at times and struggled to match up against his pace and agility. Garoni took a nice mark just inside 50 late in the first term but failed to convert the tough shot. He was well held all day and really struggled to get involved in the game, getting no help from the poor delivery by his teammates. 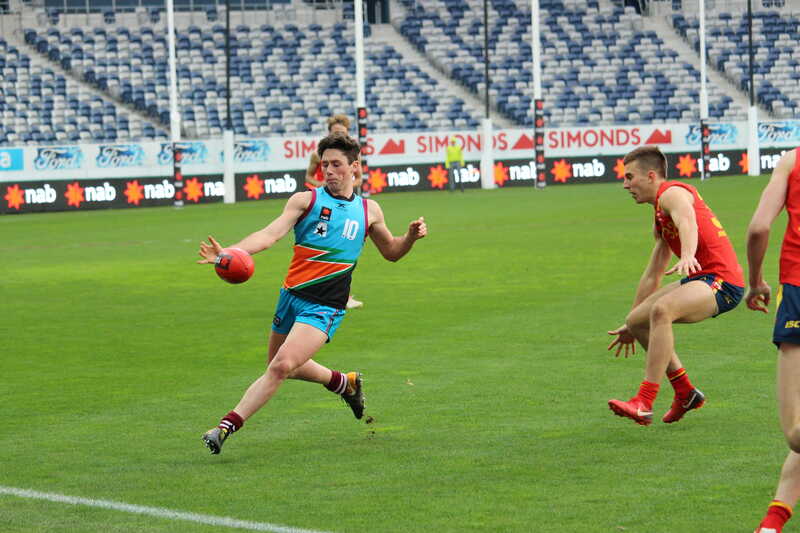 The TAC Cup leading goal kicker provided a target for Vic Country and despite not getting much of the ball he was able to provide a contest and bring the ball to ground most of the time. Bowman played as Vic Country’s number one ruckman and battled hard all day. When resting up forward, Bowman had an opportunity at goal but badly hooked the kick. His disposal use was good at the contest and in congestion, especially his hands. He was the best ruckman on the ground and always provided second efforts. Idun tried hard in defence and used the ball quickly by hand. Idun impressed with his ability to read the play and his footy smarts. He was able to effect the contest either by spoiling or taking the intercept mark. He often kicked the ball down the line instead of either switching the play or finding the short option, however. Played a solid game on the outside, predominantly running along the wing and causing some headaches for the opposition. His best game of the carnival, but one that should hold him in good stead for the final game on Wednesday given his obvious talent. A great vertical leap and strong tackler, his tackle unfortunately caused Laitham Vandermeer to come off on a stretcher in the first term, but such was his class, went over and checked on him before they took him off. It was clear his leadership is fantastic around the ground, getting to players and keeping them focused. With the ball, he is classy both through his disposal and ability to force teammates to move in certain ways. He has great vision and ahows clean hands under pressure. 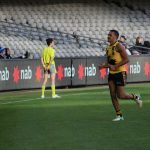 Most people outside of Western Australia would not have heard of the livewire forward who is a member of the West Coast Next Generation Academy, but by the end of the match, the brother of Brisbane’s Charlie, had everyone talking. He booted five goals and just caused a nuisance of himself down forward, showing a swagger with five majors, and could have had a couple more. He has a great vertical leap and great acceleration, burning off Zac Foot and Tom Berry – both of whom are lightning quick themselves. Had a promising game in defence, using the ball well by foot, while also putting pressure on the ball carrier. He positions himself well when inside defensive 50 and showed good hands in the third term to give it to Sydney Stack on the wing who set up a goal with the next kick. He reads it well in traffic and puts it to his teammates advantage. Started the game like a house on fire, and while he tired out towards the end, he showed glimpses of what he was capable of. He laid some strong tackles early, and gathered it cleanly at ground level. He snapped a great goal in the first term. Went for a massive ride on the wing in the fourth term, but could not bring the ball down. I was impressed with the Under 16s state captain and his work through the middle. He always went in hard and showed good hands to give-and-go with hard running. He laid a great run-down tackle on Tom Berry and Sam Walsh, and made good decisions in traffic. He reads the flight path of the ball so well, intercepting a handball in tight and then showed off his hard running by winning the ball on the wing, delivering a short pass forward then was on the receiving end inside 50 two possessions later. His set shot fell short, however. Just finds the football and works really hard between the inside and outside midfield, laying strong tackles and burying himself under packs. Booted the one goal, had another chance when running inside 50 but just missed. Is more of the ball-winning work-hard-in-transition type more than anything, and he covers ground as well as anyone. Looks like he has a huge tank for the amount of running he does between the arcs. Another promising performance from a player who was clear in defence and used good speed to evade opponents. He showed a good turning circle to step around Oscar Brownless and laid a great run-down tackle on Toby Bedford, albeit Bedford got his handpass away (see pic). Hurt himself from going in hard to spoil a ball on the wing, but showed good courage in doing so. The Fremantle Next Generation Academy member is an eye-catching type who shows lightning quick hands in traffic and tries to take the game on whenever he can. Did not win a heap of the football – just the 10 touches – but he does have the Jets to hurt opposition sides. One of the more impressive West Australians on the night, Stack continued to be involved throughout the four quarters. He provides great run-and-carry, and often draws opponents to him before firing off a handball to a running teammate. Stack showed good vision and skills on the night, and set up his forwards well with good kicks to their advantage. He produced a great kick to Jason Carter later in the night at top speed, and was strong to stand up in a tackle and tap the ball along the ground to his teammates advantage. Just needed to capitalise on the odd decision making error better, but overall a strong performance. A super impressive defender who certainly threw up his name given his willingness to take the game on and remain composed in the back half. He won plenty of it in the first half in particular, and just mops up from the half-back line. He had six rebounds and four inside 50s from 23 disposals, pushing up the ground and rarely wasting a touch. One to watch going forward. Had an okay match, doing his best work on the defensive end, laying six tackles to nullify contests on the inside. He is a long kick of the football and was able to hit up Mitchell Georgiades inside 50 in the opening term. Landed awkwardly after going up in a marking contest and was limping for a bit. Had a third quarter shot on goal but missed to the left. A midfield bull, Robertson is putting his name forward as an exciting prospect for the 2019 National Draft. His attack on the ball and man is frightening. The Subiaco midfielder was explosive in the midfield, kicking the opening goal of the game (a set shot from 50 metres), and setting up other multiple attempts. His clearance work was sublime. Was originally meant to start forward for the Black Swans, but was shifted to defence after Greaves suffered an arm injury. In defence he was an intercept king and mopped up everything. The East Perth product went off early with what appeared to be an elbow injury in the first quarter. The Busselton product was outstanding in defence for Western Australia. His second third defensive efforts were to be marvelled at, especially in the second quarter when he spoiled a ball and then smothered an attempted kick on goal. The 2015 All-Australian representative was outstanding in defence, racking up possessions and distributing with aplomb. What’s even more exciting about Spooner is his ability to also push into the midfield. Opposed to Sam Flanders (who only kicked one goal), the 17-year-old was outstanding. He was solid in the air and on ground level, and his positioning was outstanding for someone his age. In his first game of the Championships, Medhat displayed promise as a key forward prospect. His leading patterns and marking ability were solid and his skills were on full display. The imposing key forward was instrumental, always providing a presence inside 50. He also pinch-hit in the ruck and at times played as a big-bodied midfielder. The sky is the limit for O’Reilly. The nuggety midfield was his busy self in the middle, winning the hard ball before dishing it to his outside runners. His thirst for contact was evident and his awareness was brilliant, as he got others into the game. Despite only gathering nine possessions, Georgiades displayed promising signs as possible draftee next year. He also took five marks, and almost secured “Mark of the Championships” when he flew high above a pack in the first quarter. With Luke Jackson out of the team, a heap of responsibility was placed onto Buller and he did not disappoint. The AFL Academy member always competed strongly in the ruck contest and was very mobile around the ground. PEEL Thunder has kept pace with top-of-the-table Swan Districts after a solid victory on the weekend, while Subiaco is not going away either following a 40-point win over East Perth. Claremont has survived a close encounter to knock off West Perth by two points on the weekend. Trailing by 11 points at quarter time, the Tigers booted the only three goals of the second term to regain the lead by the main break and take a seven-point advantage into half-time. Both sides managed a goal in the third term and then the Falcons pushed hard in the final quarter, booting three goals to two, falling just short of the Tigers in the end. Returning from West Australian duty during the National Under 18 Championships bye for the state, Tigers’ Rylie Morgannotched up 26 disposals, three marks, six inside 50s and laid seven tackles. Max Grant also had 26 disposals, while laying four tackles, and Thomas Baldwin had 22 and seven. Nathan Pearce took seven marks to go with his 21 disposals, while Isaac Barton booted two goals from 16 disposals. Angus Longmire and Jordon Reid were influential in the ruck with a combined 47 hitouts. Nathan Murray racked up 34 disposals, five marks, four tackles, five inside 50s and a goal for the Falcons, while Jaxon Prior also found a heap of the ball with 32 disposals, seven marks, five inside 50s and three tackles. Eamon Gilbert was a standout in the ruck and across the ground, having 26 hitouts to go with 17 disposals, four marks, four tackles, three inside 50s and a goal. Henry Ryan laid a game-high 10 tackles, while Tom Medhat was solid with 23 disposals, four marks and five tackles. 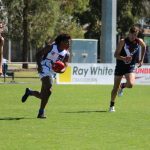 A five goals to three final quarter has resulted in East Fremantle racing away from Perth to record a 28-point away win. The Sharks raced out of the blocks to boot five first quarter goals and lead by 20 points at the first change. By half-time they held a 15-point advantage, then put the foot down in the second half to run away with the game. Perth had more disposals than their opponents, but East Fremantle was dominant in the ruck, amassing 63 hitouts to their opposition’s 14. Corey Robinson and Trent Rivers both had 18 disposals for the winners, while Edward Curley booted three goals up forward from 14 disposals and five marks. Max Murphy took six marks to go with his 17 disposals and two inside 50s, while Cody Smith booted a goal to go with his 16 disposals and six marks. The dominant ruckman on the ground by far was Nicholas Watson, who finished with a whopping 48 hitouts for the game. Perth had its top-end talent return to the side after West Australian duties but could not get over the line despite some impressive individual performances. Luke English had his best game of the year with 40 disposals, 10 marks, four tackles, seven inside 50s and a goal, while Sydney Stack racked up 33 disposals, five tackles and five inside 50s. Ian Hillbooted three goals from 14 disposals, while Maverick Hamilton had 27 disposals, six marks, six inside 50s, three tackles and a goal. Ethan Hansen was the other major ball winner with 22 disposals, four marks, three inside 50s and a goal. Subiaco has heaped more pressure on cellar dwellers East Perth with a commanding 47-point victory away from home. The Lions restricted their opponents to just four behinds in the first half, before the Royals came out firing to boot five goals in the third term. It was a case of too little, too late, but there was some consolation for East Perth, forcing the Lions to boot 2.12 in the final term and restrict the final margin getting out any more. In returning from West Australian duties, Luke Foley had 27 touches, three marks, 10 inside 50s and laid nine tackles, while Will Hickmott was also important with 24 disposals, two marks and five tackles. Tristan Hobley was the most prominent ball winner, racking up 32 disposals, five marks, five tackles and four inside 50s, while Zane Shellabear Healey and Jacob Peletier both had 23 disposals. Prominent goal kicker Jack Mayo was limited to 1.3, but instead Nicholas Martin stepped up, booting 3.2 from 16 disposals and four marks. For the Royals, Louis Miller had 28 disposals, four marks, four inside 50s and three tackles, while Damon Greaves was the other big ball winner with 27 disposals, six marks and five tackles. Rhai-Arn Cox was the only multiple goal kicker with two majors from nine disposals and four marks, while Eric Bashemule and Rory Sparks both recorded 18 disposals and six marks each. Peel Thunder has moved to within percentage of ladder leaders Swan Districts, albeit with the Black Swans having a game in hand. 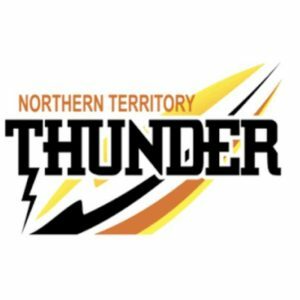 The Thunder came from behind to power home in the last quarter against South Fremantle, booting six goals to zero and record a comfortable 34-point win. The Bulldogs looked good in the first three quarters, holding a two-point lead at the final break, but a 6.1 to 0.1 final quarter in favour of the visitors put to bed any chance of an upset. Jackson Perry was the top disposal winner for the Thunder, notching up 23 disposals, four marks, three tackles and five inside 50s. Brad Oldfield was also prolific with 21 disposals, nine tackles and five inside 50s, while Michael Randallbooted a goal from 19 touches and six tackles. James Sturrock also managed 19 disposals and three marks, while Jarrod Fazioli kicked a goal from 15 disposals. Ben Middleton and Lachlan Cullen were the major goal kickers with three majors each. Billy Chambers had a day out in the ruck with 43 hitouts. For the Bulldogs, Tom Blechynden had 23 touches, nine marks, four tackles and two inside 50s, while Matthew Wardlaid a game-high 10 tackles to go with 20 disposals and four marks. Toby McQuilkin, Enrique Aiken-Featherstone and Neil Irani all had 16 touches, while Thomas Weston booted two goals to be the only multiple goal kicker for the home side. Regan Spooner laid six tackles to go with his 13 touches. SWAN Districts has overcome a plucky Claremont side, while Subiaco had to fight hard to knock off East Fremantle in a round of mix results for the West Australian Football League (WAFL) Colts competition. A fadeout in the second half has seen Claremont just miss out on causing one of the upsets of the season, going down to Swan Districts by five points. The Tigers led at the main break, having booted five goals to three in the opening half, but a goalless third term which saw the Black Swans pile on four goals ultimately turned the momentum. While Claremont booted three of the final five goals, the damage was done, just missing out on a memorable win. Mitchell Bain was the highest disposal winner, notching up 25 touches, one mark, three inside 50s and laying seven tackles for the winners, while Sebastian Bright had 19 disposals, five tackles and booted a goal. Jarrod Brockbend was their only multiple goal kicker with two goals from 10 disposals, three marks and eight tackles, while Kade Wallrodt was frenetic with his tackling, laying nine to go with his 15 disposals, eight marks and a goal. For the Tigers, Corey Hitchcock found the ball 26 times, took three marks and laid seven tackles as well as booting a goal, while also being in the umpires good books with four free kicks. Thomas Baldwin was prolific with 25 disposals, five marks and seven tackles, while Isaac Barton was one of the best going inside 50, pumping the ball into the forward line six times to go with his 22 disposals, three marks and nine tackles. Jordon Reid was good around the ground in the ruck, amassing 15 disposals and 22 hitouts, while Benjamin Schuhkraft booted three goals to be the key goal scorer on the day. After losing a string of games following a strong start to the season, Subiaco has held off a brave East Fremantle outfit to record a 13-point win. Trailing at quarter time by four points, the Lions booted five goals to three in the second term to take a nine-point advantage into the main break. The Sharks hit back with three goals to one after the long break to lead by 10 points with a quarter to go. Fearing an upset, Subiaco stormed home with an impressive six goals to three final term, also kicking five behinds in what could have been a larger margin. With his brother impressing for Western Australia, Liam Hickmott went to work for the Lions, notching up 32 disposals, two marks, six tackles and two inside 50s, while Tristan Hobley recorded 28 disposals, five marks, two tackles and three inside 50s. Subiaco’s best through the midfield was arguably Taj Schofield, who had 24 disposals, three marks, four tackles, six inside 50s and booted 2.2 in a good day out. Up forward it was another day out for Jack Mayo who slammed home six goals from 13 disposals and seven marks in a big game, while Zane Shellabear Healey had 24 disposals, four marks and two inside 50s. For the Sharks, Trent Rivers was the top disposal winner with 22 disposals, six marks, five tackles, two inside 50s and a goal, while Corey Robinson had 20 disposals, two marks, four tackles, six inside 50s and also booted a goal. Nicholas Watson was prolific in the ruck with 20 hitouts from 14 disposals, while Dane Jenzen had a game-high seven inside 50s, and Ethan Brown was the only multiple goal kicker for East Fremantle. With their top-end talent away on state representative duty, Perth succumbed to bottom four side South Fremantle in a one-sided affair. The Demons failed to score in the opening term and by half-time, the Bulldogs had opened up a 35-point lead. Never looking back, South Fremantle put the foot down in the second half, piling on 6.12 to 2.4 to run away with the match by 67 points. The match was best summarised by the lopsided inside-50 count of 55-21. Not a huge individual possessions side, Tom Blechynden topped the winners’ disposal list with 20 touches, six marks and four inside 50s. But it was hard to look past Luke Moore for the best on ground, booting a mammoth seven goals from 13 disposals, seven marks and two tackles, while Thomas Weston also had multiple shots on goal, but kicked four behinds from 15 disposals and 15 hitouts. Enrique Aiken-Featherstone had 19 disposals, four marks and laid a match-equal-high tackles with nine, while Jack Fenton was the prolific ruck on the ground with 31 hitouts and six inside 50s. For Perth, Zac Casey was the clear stand out with 29 disposals, five marks, eight tackles and three inside 50s, while Connor Sing kicked a goal to go with his 19 disposals, three marks and three tackles. Simon Hayward and Austin Davis both had 19 disposals and laid five tackles, while Zak Tanner worked hard in the ruck for 26 hitouts and eight disposals. Peel Thunder has claimed a comfortable win over West Perth on the back of a solid four-quarter performance. Dominating the inside-50 count, Peel always looked in control and booted six goals to four in each of the halves, including six goals to two in the second and fourth quarters. James Sturrock had a day out with a round-high 36 disposals, nine marks, eight tackles and six inside 50s for the winners, while Jackson Perry was also prolific with 27 disposals, seven marks, two tackles, two inside 50s and 1.3. Jacob Hewett notched up 20 disposals, six marks, four inside 50s and booted a goal, while Lachlan Cullen was the key man up forward with four goals from nine disposals and six marks. Billy Chambers had 24 hitouts and 13 disposals in the ruck, while Jarvis Pina had five inside 50s and six tackles to go with his 17 disposals. For the losers, Nathan Murray had the highest disposal tally to go with eight marks and five tackles, while Ben Johnson (23 disposals, four marks) and Brayden Templeton (22 disposals, three marks and eight tackles) were the other big ball winners. Callum Johnson booted three goals from 11 disposals and four inside 50s, while Lachlan Rewell also had multiple goals to go with his eight touches and three marks. 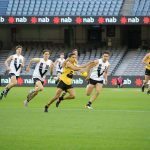 WESTERN Australia has announced the initial squad for the National AFL Under 18 Championships to be played across June and July. The WA State Academy features 38 players, with a second intake of Under 18s players set to occur in the coming weeks. The announcement came in the same week South Australia announced its extended squad for the championships. The West Australian side features a good spread of players from across all nine clubs with Claremont and Perth leading the way with six each, while East Fremantle has five. No club has less than three, with seven 17 year-old development players included in the side. Demons star Ian Hill has firmed as the state’s top draft prospect, but the team has good depth, and includes players from the West Australian National Under 16 Championship-winning team last year, such as livewire Rhai-Arn Cox who took the final mark of the match with seconds remaining and kicked a goal after the siren to win the game. 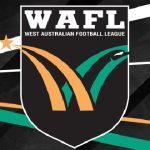 West Australian Football Commission (WAFC) Executive Manager Talent and Football Operations, Scott Baker, told the WAFC website that the players should be proud of their efforts. Western Australia takes on South Australia in the opening game of the National AFL Under 18 Championships at Alberton Oval on June 3, before hosting Vic Metro at Optus Stadium on June 19. The championships conclude with games at GMHBA Stadium and Etihad Stadium on June 29 and July 4 against Vic Country and the Allies respectively.